Xiaomi has released world's first edgeless display smartphone powered by Android mobile operating system. The design of this phone is quite unique and attractive as compare to any other conventional smartphone available today. Xiaomi is very well-known for its quality products at low-cost and it's MIUI OS is also very much popular amongst smartphone users. Today we are writing a detailed review of Xiaomi Mi Mix Specifications, Features, and Price Details for users who are willing to buy this edgeless phone. Mi Mix smartphone offers three network technologies i.e. 4G (LTE), 3G (HSPA) and 2G (GSM) bands. Its body dimensions are approx. 158.8 x 81.9 x 7.9 mm, and weight is approx. 209 grams. Mi Mix has Dual Nano-SIM, dual stand-by feature too. The display screen is capacitive touchscreen IPS LCD and it has 16 million colors for sharp visibility. The screen size is approx. 6.4-inches having 83.6% screen-to-body ratio. The screen resolution is 1080 x 2040 pixels having 362 ppi pixel density, and it's a multitouch phone too. When we talk about its software, the mobile operating system of Mi Mix is powered by Android Marshmallow v6.0, which is based on MIUI 8 xiamo's official custom firmware. The hardware side is quite strong, and its chipset is Qualcomm MSM8996 Snapdragon 821, its GPU is Adreno 530, and its CPU processor is Quad-core (2x1.6 GHz Kryo & 2x2.35 GHz Kryo). The internal storage capacity is 128GB with memory RAM of 4GB and 256 GB with memory RAM of 6GB, and it's doesn't have any memory card slot. The primary camera is 16 mega-pixel with dual-LED (dual-tone) flash, autofocus, phase detection, f/2.0, EIS (gyro), face detection, touch focus, Geo-tagging, panorama, and HDR features and functions. The secondary camera is 5 mega-pixel, and video recorder is capable of 720p@120fps, 1080p@30fps, and 2160p@30fps. 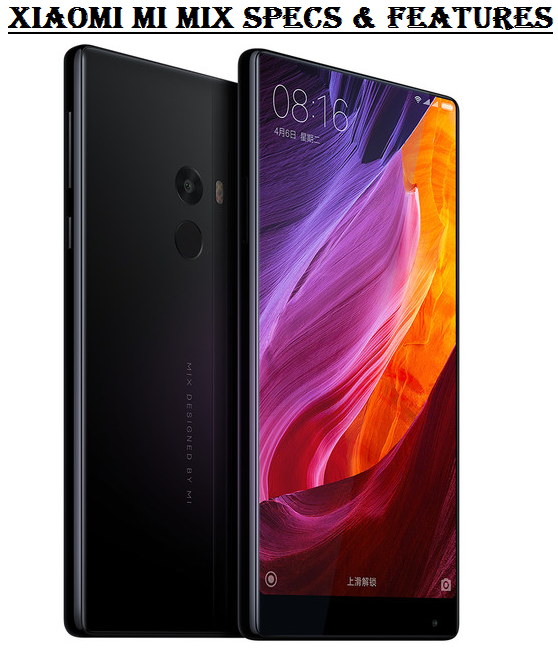 For connectivity and communication, the Xiaomi Mi Mix specs has WLAN with Wi-Fi 802.11 a/b/g/n/ac, dual-band, hotspot, and WiFi Direct, Bluetooth v4.2 (A2DP and LE), GPS with A-GPS, BDS, GLONASS, NFC, and a USB Type-C 1.0 with reversible connector for data transfer and phone charging. 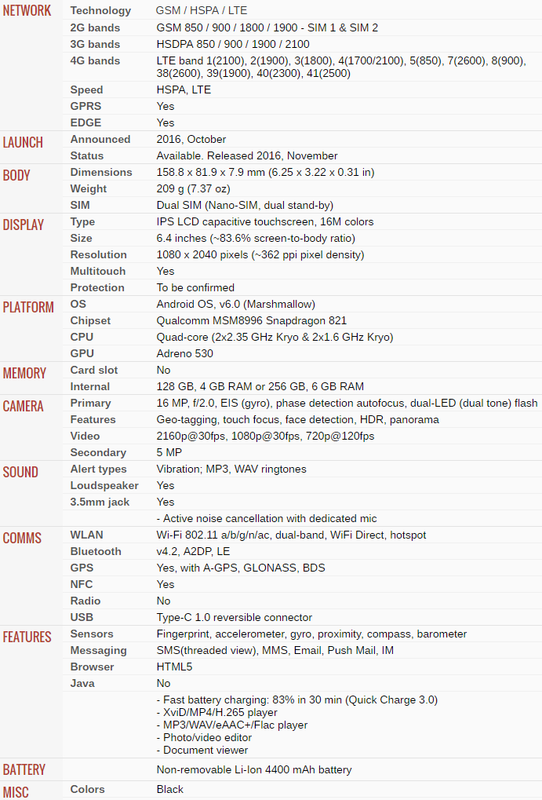 The phone also features multiple sensors i.e. fingerprint, compass, gyro, proximity, accelerometer, barometer. The battery of Mi Mix is Li-Ion 4400 mAh with Quick Charge 3.0 function, and its a non-removable battery with fast charging upto 83% in 30 min. Xiaomi Mi Mix is publicly available for purchase from Xiaomi Store worldwide, and it's officially available in Black color option only. The official price of Xiaomi Mi Mix is approx. 550 EUR or $585 USD.